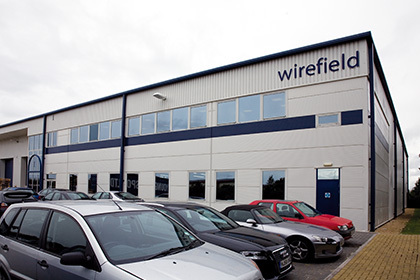 Wirefield Ltd. is one of the UK’s leading independent manufacturers of energy efficient industrial, retail and commercial luminaries. Particular emphasis is placed on luminaires intended for use in exposed and hostile environments where an ingress protection (IP) rating is essential. The company focuses on offering exceptional value for money without sacrificing product performance. The highest quality branded components are used which ensures a long service life thereby reducing the whole life cost of any installation. Full guidance is available in respect of luminaire suitability for the proposed application, together with free installation design assistance to ensure that the intended illumination levels are achieved. Wirefield Ltd. aims to satisfy end user requirements by identifying specific needs, matching them to the correct luminaire or if necessary modifying a standard product to more efficiently meet the objective. A further aim is to offer a one-stop shop value for money package, encompassing capital, installation, running, and maintenance costs. All products are exclusively distributed via an extensive national network of electrical wholesalers which are in turn supported by a significant and highly refined bulk distribution warehouse based in Fareham, U.K. Availability is our key objective and most deliveries are ex-stock. Our target markets are industrial, retail, commercial, infrastructure, and leisure sectors. Typical applications are, warehousing, factories, car parks, agricultural buildings, sports facilities, general security, bus and train stations, ports, and temporary site lighting. Since the inception of Wirefield Ltd. in 1992 the company has consistently invested in the most modern tooling and manufacturing techniques available anywhere in the world. This has assured Wirefield’s dominant position in the market by continually improving quality, reliability, and ease of installation of its products whilst maintaining a competitive pricing structure. Wirefield Ltd. were one of the very first lighting companies to become ISO rated within the British Standards Institution in 2000, we maintain these high standards and are currently certified to ISO 9001:2008. Quality – Wirefield Ltd. is committed to providing customers with in-depth quality products. Our policy is to manufacture and supply only products that ensure safety, quality, performance and reliability. The ENEC mark represents the harmonisation of the major European approval authorities and ensures that the products which carry the mark comply with the most stringent international conditions and regulations relating to EN 60 598. The CE mark signifies that a product conforms to the requirements of relevant EEC directives relating to Electromagnetic compatibility (EMC) and the Low Voltage Directive (LVD). Where appropriate all Wirefield products are tested and comply with all the above directives.